It's great to see the number of segregated cycle tracks starting to appear on London's streets. These are great pieces of cycle infrastructure, that will enable people of all ages to cycle in London who wouldn't have been able to previously. A picture posted by Carlton Reid on Twitter just the other day shows a massive design flaw of the segregated cycle superhighways, yet nobody within the cycle campaigning community seems to have picked up on it. These so-called "low level signals" are meant to be at the eye level for a cyclist. BUT HOW CAN THESE BE CONSIDERED EYE LEVEL FOR A CHILD? If we really expect children to be using these routes, then we should be catering for them. Low level signals are clearly designed to discriminate against children. Therefore cycling campaigns must start campaigning for signal equality for children. 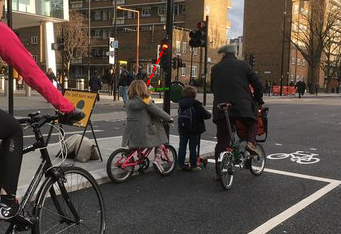 Please sign the petition to introduce lower level signals today, to enable to children to experience the same signal equality as adult cyclists. If children are unable to use the new superhighways, it puts all future cycling infrastructure at risk! Don't let that happen. TFL are currently consulting on upgrading the Westminster Bridge Road gyratory junction. And while the plans are a vast improvement, they come with many problems. Therefore, I've continued the two way track all the way around the gyratory in my version. It also makes more sense than a one way track because cycles have no reason to want to be in the centre of the gyratory, except for access to the hotel. A two way track reduces the distance cycles need to travel for some movements, and no movements are disadvantaged, except for some that are extremely unlikely to be made. 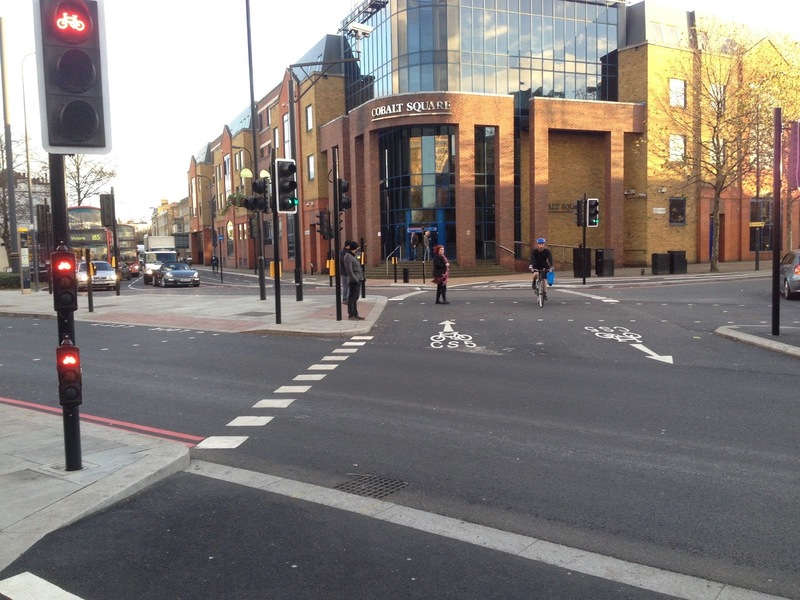 Also, the cycle lanes TFL propose have wide sweeping corners for motor traffic to left hook cycles. The effects of these can be reduced through good design, but a two way track removes this conflict completely. None are ideal but I went for the latter, as it gives cycles the best routes through the junction, while still allowing buses to turn around here. 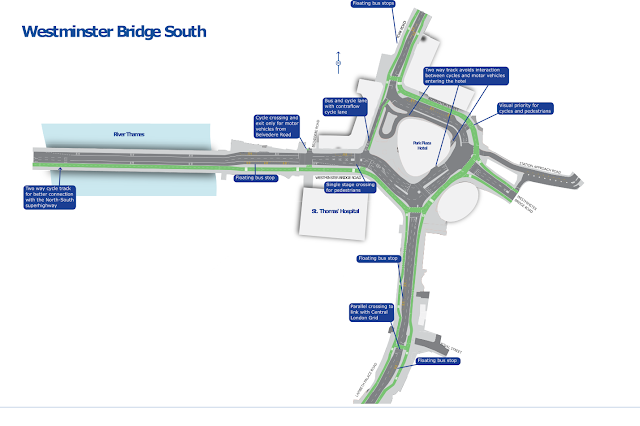 Overall TFL have produced a very good set of proposals for this junction. However, they demonstrate the main issue that TFL need to resolve regarding cycling, interactions with pedestrians. Once TFL realises that only interactions with motor vehicles require signalisation, I think we will start to see these issues ironed out. Please let me know your comments/criticisms etc regarding my version, it really helps! There are two things you need to understand before I can start this blog post. Firstly, the South East Wales Metro project is a £2bn project to improve public transport in the South East Wales area. The main project is the electrification of the Valley Lines, but the scheme will also improve bus services. Wales Online has a nice overview here, and there is a page about it on the Welsh Government website here. The Welsh Ministers and each local authority must, in the exercise of their functions under Parts 3, 4, 5, 9 and 12 of the Highways Act 1980 (creation, maintenance and improvement of highways, interference with highways and acquisition of land), in as so far as it is practicable to do so, take reasonable steps to enhance the provision made for walkers and cyclists. This essentially means that cycle and walking facilities must be improved on upgrades to and the creation of new road schemes. This brings me to the start of the blog post, and an introduction to the Upper Boat Gyratory. 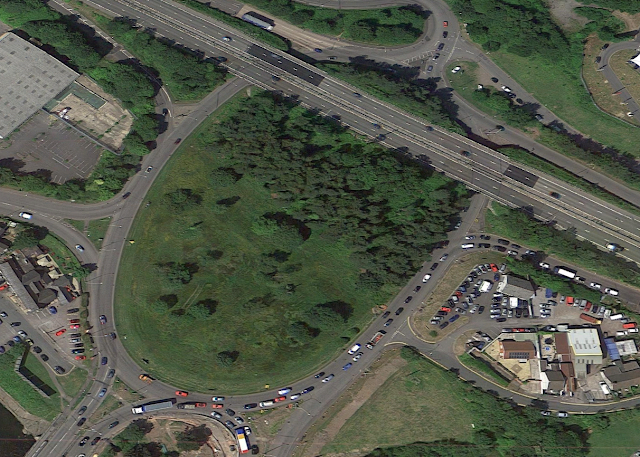 The gyratory is a large roundabout, connecting 2 main arterial routes, 2 roads for more local access (although still carrying large amounts of traffic) and a small dead end that contains a few houses. This gyratory currently has no provision for cycling, bar a shared use path on either side of the road to the South East of the gyratory, which ends abruptly at the roundabout. And while there are pavements, all crossings are uncontrolled, including the one signalised arm of the roundabout, which only just manages tactile paving and a dropped curb. On 15th September this year, Rhonnda Cynon Taff council announced it was to start work on the gyratory, with £6.9m from the Welsh Government and other sources, and a newly obtained £2.4m from the South East Wales Metro project, to reduce bus journey times. Great, you might think. With Active Travel Act legislation in force in Wales, and with a specific funding source to improve bus journey times, this might be a chance to improve this gyratory for people and public transport users. Ha! Call me cynical, but with the lack of consultation, and the track record of my local council when it comes to provision for cycling and walking (that could be a blog post in itself), I decided to submit a Freedom of Information request, to get the plans for this scheme and to see if cycling and walking had been catered for here. At this point, I had no concerns about the way in which this scheme was funded, although I knew money for bus improvements had been sourced. And having looked the response, everything is worse than I expected. What would you do to prioritise buses? The obvious answer is of course bus lanes, meaning buses can bypass traffic congestion in the general traffic lanes. What is currently being done at Upper Boat is that extra traffic lanes are being constructed. With money for public transport. The logic being that if there is less congestion, buses don't get caught in it. This is extra capacity for private cars, paid for by public transport money. Nothing has been constructed for buses here, yet the gyratory has recieved £2.4m out of a fund for them. This isn't the first time that funds for sustainable transport have been misued in the UK, Mark Treasure has a blog post about LSTF fund money being misused in West Sussex, but in those examples, they at least tried to make it look like they were using the funds for cycling. Remember the Active Travel Act? 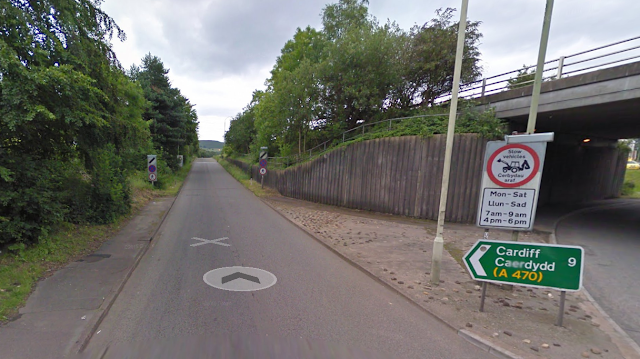 In a scheme such as this Rhondda Cynon Taff must take reasonable steps to improve provision for cyclists and walkers. I guess 'reasonable steps' is open to interpretation. But it is clear these reasonable steps have only been taken where it creates no disbenefit to motorised traffic. "Benefits of signalised pedestrian crossing upgrades (included in this scheme at the base of both A470 offslips) are that signalised crossings are preferred by visually impaired people, people with learning impairments and other groups of pedestrians including older people who have difficulty in crossing the carriageway in the existing informal crossing arrangements. Other crossing design features will be tactile paving and rotating cones and audible signals for visually impaired pedestrians and adequate visibility to the crossings to ensure that approaching motorists can see a pedestrian or dismounted cyclist about to cross the road"
Great for blind people? I'm not blind myself, so maybe I'm underestimating the ability of a blind person. But there is no point having a great pedestrian crossing if all it does is lead you to a uncontrolled crossing point of a 70mph slip road. I don't think a blind person could cross a 70mph slip road unaided, but at least they can get to the crossing and then turn around. We are adding a lane, but also adding tactiles. Hooray for balanced transport policy! While my Freedom of Information response tries to justify the provision for pedestrians, cycling gets nothing at all. Shared use cycle paths are outside the scope of this scheme. The footways are of inadequate width and the land beyond the back of the footway does not belong to RCTCBC. There is also insufficient room to create a cycle lane however, the existing cycle paths either side of Main Avenue have been retained. Certainly, my interpretation of Section 9(1) of the Active Travel Act means this scheme is illegal in Wales. But the lack of consultation with the public means that there was no opportunity for this to be raised. And I hate to be a conspiracy theorist, but my Freedom of Information request may well have been delayed so that the illegality of this project couldn't be raised until construction had started. To me that seems entirely plausible. I'm not sure. This scheme cannot be stopped, it is already half complete. And if Rhonnda Cynon Taff council continue their policy of not consulting with the public then there is little chance of schemes like this being stopped in the future. The Active Travel Act is great and all, but with no enforcement, it means very little on the ground. 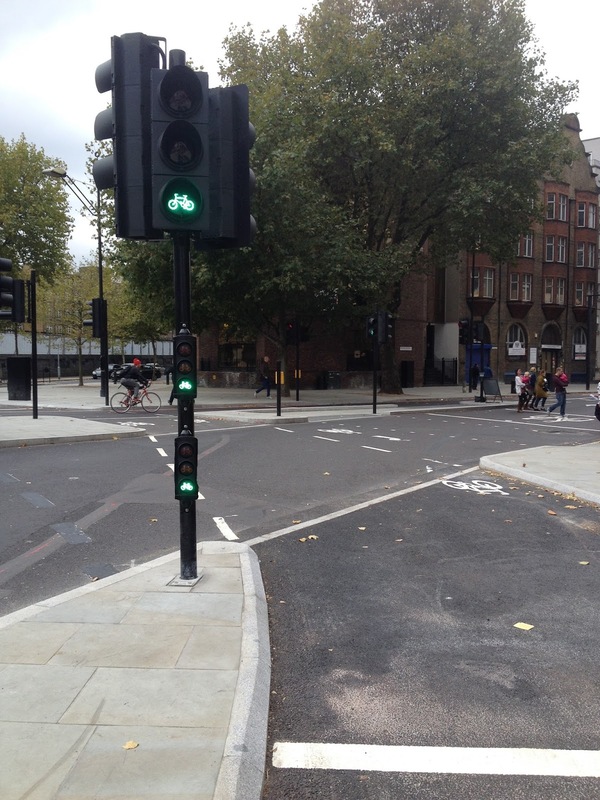 A short section of the East-West Superhighway has opened on the Embankment in London. And it is fantastic. There are plenty of informal crossing points for coach passengers, but this blog post is to focus on how TFL have designed the pedestrian crossings at junctions, since we now have one operational example of it. But this treatment on Embankment is bad for cycles and pedestrians. They are bad because they cause unnecessary delays for cycles and pedestrians. While cycles have to wait a short period for the signal to turn green after pedestrians have crossed, when I timed how long it took for pedestrians to cross it took 57 seconds for pedestrians to get a green man. With a zebra crossing here pedestrians and cycles would barely have to wait for each other at all. Pedestrians who wait for a green man may have to wait up to 57 seconds to do so. Also, few people wish to use TFL's stagger arrangement, because it is unnecessary and indirect. Most pedestrians vote with their feet and don't use it. This isn't some form of protest, it is just people following the most direct route. Fully expected behaviour that TFL attempts to deny the existence of. Even for westbound pedestrians, the crossing is unattractive and off the desire line. This is a negative blog post about an otherwise fantastic piece of infrastructure, but problems like this need to be addressed, because otherwise this will become the standard design for London. We can't ignore problems like this just because it is better than before. You probably saw my blog post about this maliciously bad cycle facility put in by Kent Highways during my time at University. I wanted to make an update because the understanding of what happened on Old Chatham Road has changed since my blog post. It turns out that this scheme is a 6 month experimental traffic order, and therefore only the minimum amount of cycle provision was added. It strikes me as bizarre that when considering what would be the minimum amount of effort required for cycle provision, the empty space wasn't considered as usable. Kent Highways are even going to the effort to source money to widen and resurface the footway, when there is a wider and well surfaced area right next to the footway. However, since this is an experimental traffic order, it is up for consultation. I would like object to the experimental traffic order on Old Chatham Road in its current form. The completely unused space between the southbound traffic lane and the footway should be used for a cycle facility, because it will provide a much more suitable space for cycling than the current narrow footway. I understand that KCC intends to widen and resurface the footway, however it would still be narrower than the unused space on the carriageway, and there are other shared footways on this route that would benefit from money to widen and resurface the footway. It seem to me that the highways department at Kent County Council seem to think it is acceptable to shove cycling onto a footway the minute any sort of difficulty arises. Hopefully a large response to this consultation will change their minds. Use this space, this space here! EDIT - I've removed the link to report this to KCC. I believe they've got the message. I'm not a massive fan of the Kent Highways department. Therefore to say I've never been so angry at them about something means quite a lot. Old Chatham Road used to be the main road between Chatham and Maidstone, but was bypassed by the construction of a dual carriageway to the west, before I was even born. The old road was kept for access, and is part of the National Cycle Network Route 17. The previous situation. The road was two way, with a lorry park on the left. While I was at university, this road has been changed to one way, with bollards used to prevent parking. It also has a 40mph limit. The part of the road my road my bike is on is wasted space. It does nothing at all. Therefore the logical thing to do would be to use this space to accomodate the pre-existing National Cycle Network Route. 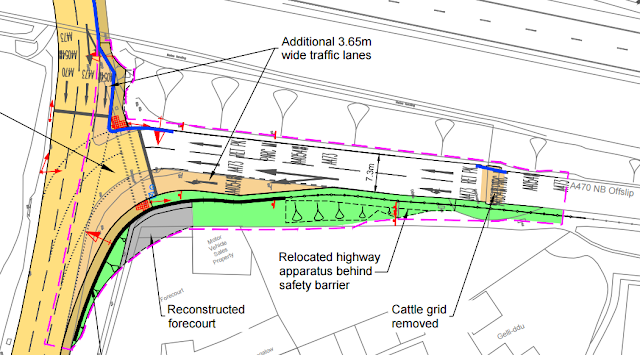 Instead, Kent Highways have decided that the best place for cycling would be on the pavement. And an incredibly poorly surfaced and overgrown footpath at that. Compare the cycling surface vs. the smooth tarmac of the bollarded of space that does nothing. Thanks to the new signage introduced in the 2015 TSRGD, this pavement can also be used by horses. Big barriers are used to prevent cycle access to this now useless section of road. The barriers also exist at the other end, forcing cycles to use the overgrown, and badly surfaced footpath. This goes above and beyond the usual crap provision that cycling gets. 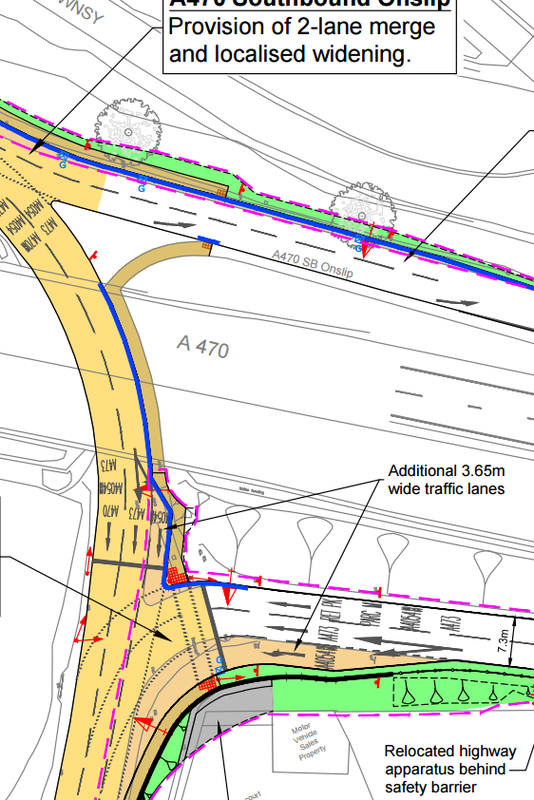 I can only see this as an actively malicious attempt by Kent Highways to prevent cycling here. I simply cannot believe that the people who design Kents roads for a living could see this as acceptable, even by British cycling infrastructure standards. Access barriers are a common sight on cycle paths across the UK. They are particularly prevalent in Rhondda Cynon Taff, my local authority. For me, the barriers are at best irritating, meaning I have to dismount and lift my 23kg Dutch bike over my head. At worst, they mean I avoid the traffic free route altogether and ride along the main road instead. I'm relatively hardened when it comes to cycling in the UK, most people would be put off cycling completely if this was the case. For other people, the barriers will completely prevent access. Anyone who is elderly or has a disability wouldn't be able to lift their bike over their head. Wheelchairs and pushchairs may be equally denied access. It isn't right that a large group of legitimate users should be blocked from using a facility in an attempt to block motorised access. This is why I've started a petition to get these barriers removed. While the petition relates to my local area, please still sign. Maybe in the future it will gather enough momentum to put pressure on other local authorities too. Access barriers are, and never have been, appropriate for a cycle route and should be gone, and never, ever installed in the future.